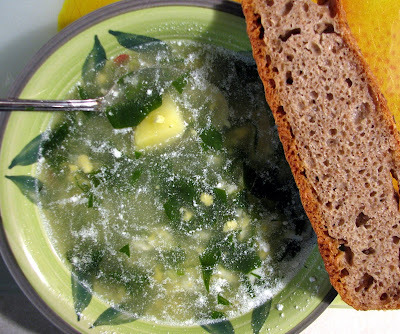 Green Borscht is a delicious soup made of spinach, scallions, sour cream, hard-boiled eggs and potatoes. I am not sure why it’s called “borscht” since the only common ingredient with the red borscht is potatoes. Notice home baked (by me) rye bread on the side. Update: NBC a-holes removed the video from YouTube, it can still be seen here.